Be Ready for the Rumble! You hear that? The sound of the drums? The restless roar of a thousand, thousand voices thrilling with anticipation? It’s comin’. 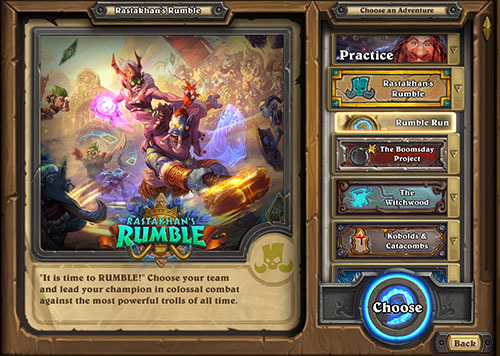 Rastakhan’s Rumble is Hearthstone’s newest expansion, featuring 135 all-new cards, coming December 4! King Rastakhan, the all-powerful god-king of the Zandalari trolls, presides over the once-a-generation event held in his name. Rumble fans are converging from all corners of Azeroth on the renowned Gurubashi Arena to attend a knock-down, drag-out, no-holds-barred, rough-and-tumble, beautifically brutal gladiatorial celebration of all things troll: Rastakhan’s Rumble! It’s an event like none other! You’ll THRILL to the roar of the crowd and the incredible crash of thudding flesh and searing spells. You’ll savor the scent of fresh funnel cake on the air! Witness with breathless anticipation as world-renowned troll gladiators put their mojo on the line to clash with magic and might--in style! When the Loa call your name and team spirit fills your thundering heart, nothing’s gonna stop you from leaping into the arena to JOIN the gladiatorial mayhem! Tall, lanky, tusked, and often sporting mohawks, trolls have a rich history spanning millenia. They were among the first people of Azeroth, and with the aid of the mighty Loa primal gods, they once presided over a monolithic empire that ruled over most of the world. While the days of empire are gone, the mighty, wily, and adaptable tribes of trolls—Zandalari, Darkspear, Revantusk and many more—can still be found in every conceivable corner of the planet. It is a noble society, with a proud heritage. And yet, the loose relationship that trolls have for the rules means that haven’t shied away from the dark mysticism of voodoo that’s at the core of their culture. 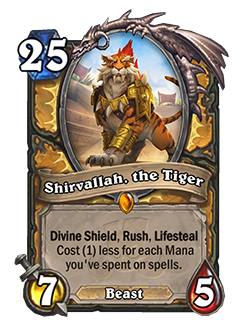 In Rastakhan’s Rumble, we’re going to visit the storied Gurubashi Arena in the steamy jungle of Stranglethorn Vale, a sacred place steeped in both the glories of the past and the unbound reckless joy of the fight! There’s winning, and then there’s winning. It’s not enough to strike the final blow – the brawlers at Rastakhan’s rumble aim to entertain! When they put their prowess on display with flashy, over-the-top finishes, cards with the new Overkill keyword are urged on to ever greater feats by the roar of the crowd. 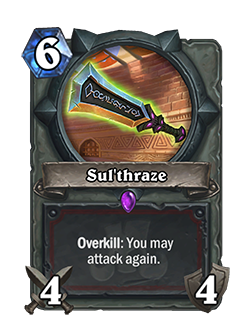 On their owner’s turn, when a card with the Overkill keyword deals damage in excess of their target’s health during an attack, it triggers a bonus effect. The Loa are incredibly powerful primal gods that have been figures of worship for thousands of years in troll culture. 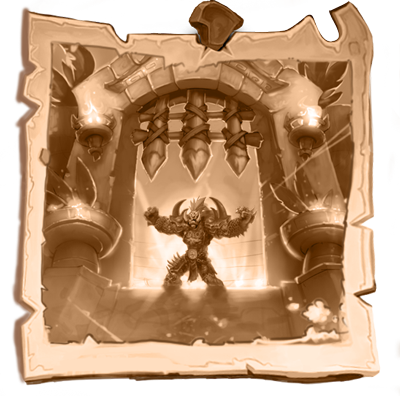 In Rastakhan’s Rumble, each Loa is the patron of a Rumble team, and they carefully pick mighty gladiators who best embody their spiritual essence. Loa are no passive mascots, they are legendary minions who bring their ancient power to the fray right alongside their teammates! The Loa have imbued each team with the essence of their power, which manifests in the form of Spirits. 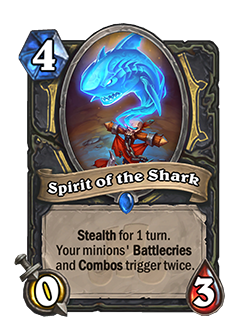 Spirits are 0/3 minions that pack potent passive powers. To ensure that each team has an opportunity to show off skillful use of their power, each Spirit has Stealth for one round! Each of the teams has a legendary Champion—a most-valuable-Rumbler from the past who each specialize in the fighting style of a different Class. These mighty trolls are heroes and villains of history who have proven their mettle in the Rumble, though there are a handful upstarts shaking things up in this year’s Rumble. Hopefuls from across Azeroth are converging on Gurubashi Arena to hear the call of the Loa and lend their fury to a Rumble team in glorious combat. There are nine teams, each representing a powerful Loa, and aligned with one of Hearthstone’s nine Classes. The Good Guys. Proud, noble, and maybe a little arrogant. . . They talk big, but they can back it up. They fight honorably because they don’t need to play dirty to win. The Bad Guys. Nasty, shrieking bloodsuckers who’ll do anything from demon summoning to ritual sacrifice to win. They’re ruthless, they fight dirty, and they’re proud of it. Dinosaur Parkour. The first (and wildest) team of the Rumble. A roving, raving pack of dinosaur riders that leap from Megasaur to Direhorn before pouncing on their slow-moving prey. The Fast and the Ferocious. They like animals more than people, and it shows in their strategy. The Lynxes pride themselves on clever mystical tactics and bestial fury. Masters of Voodoo. The Frogs are brilliant spellcasters, but they’re all a little…odd. They worship frogs, they use frogs in their magic. The Frogs. . . love frogs. And Lightning. The Firelords. Voodoo’s cool, but the Dragonhawks know that arcane fire is where it’s really at. They really, really, really like fire. A lot of fire, all at once. They even like fire elementals. You could say that fire is their thing. Heavy Metal. The Rhinos love to charge headfirst into the fray. They’re all about big spikes, loud music, and melting faces. There’s no problem that can’t be fixed by bashing it away. The Dirty Cheats. In a competition known for having no rules, the Sharks still manage to ways to cheat. It’s kind of impressive. They’re vicious, brutal, and devious, and those are their good qualities. Masters of Death. Spooky, unsettling, and eerie, this team sends a chill down the crowd’s spine. Bwonsamdi’s the Loa of the Dead, and a team devoted to him is just as creepy as you’d expect. They’re known for raising the dead and making dangerous bargains. 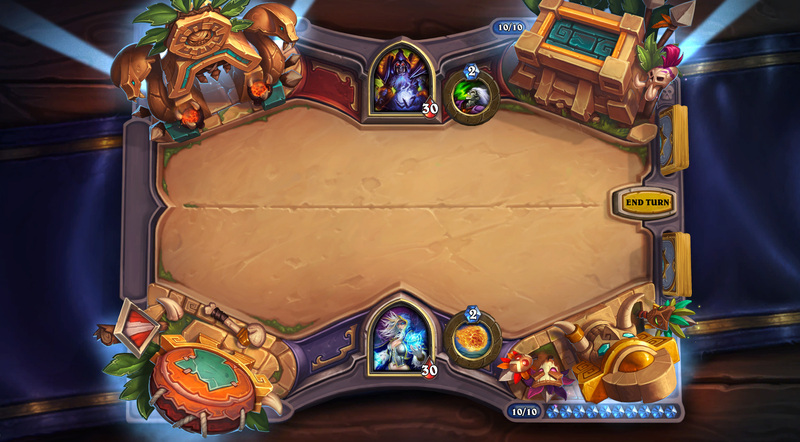 Soon after Rastakhan’s Rumble begins, you’ll also be able to take to the Gurubashi Arena in a single-player experience. You’ll take up the mantle of a young, fiery aspiring Rumbler, ready to join a team and test your might against a colorful array of Rumble champions. 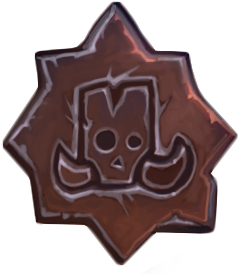 More about Rumble Run will be revealed in the coming days. Pre-purchase one or both bundles and make sure your team is ready to throw down when Rastakhan’s Rumble releases starting December 4! 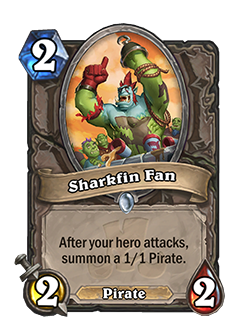 King Rastakhan won’t just be hosting the Rumble, he’ll be brawling with the best of them! When you pre-purchase this bundle, you’ll get 50 Rastakhan’s Rumble card packs, a Ready to Rumble card back, AND the new Shaman Hero: King Rastakhan! For more budget-minded brawlers, this bundle offers 17 Rastakhan’s Rumble card packs and the Ready to Rumble card back. 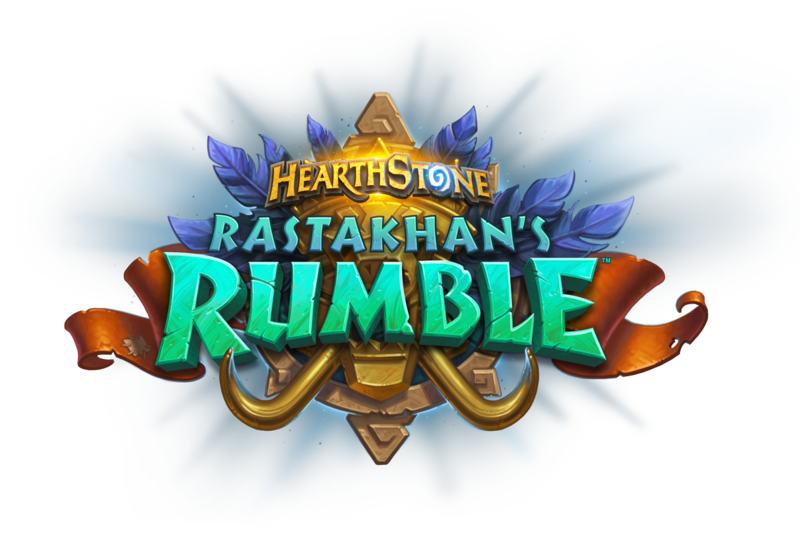 Rastakhan’s Rumble begins December 4. To be ready, soon you must decide: which Loa speaks to you? Which team will you join?